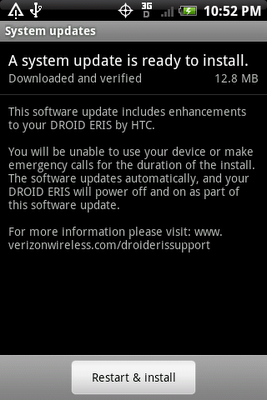 I don't know about you guys, but I've finally received my upgrade noticed for the MR4 Android update for my Verizon HTC Droid Eries. Android Central reported that the update began to trickle out to customers starting last week. MR4 is a maintenance release that addresses the "silent call" issues with the Eris and other minor fixes. The update weighs in at just under 13MB and will take about 30 minutes to install on your device from the time you start the download to the time you finish installing the update. 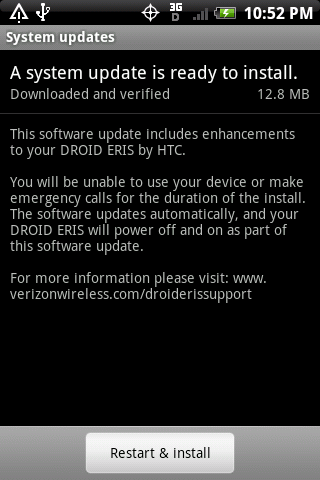 You can check for the update by going to Settings > About Phone > System updates. Jailbreakers Holding Up iPhone 4 Update?